~The Hunger Games by Suzanne Collins. « Musing Mondays (1) What ‘raved books’ are you hoping to read this year? ohh!! i remember this one! Hop you like it like I did. 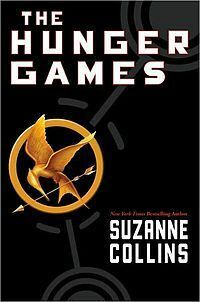 The Hunger Games is a fantastic book. Can't wait for the movie! Yay! This was such a great book. And Brooke got to read it in English class? Lucky! Oooh, I know exactly what part that is. I recently reread The Hunger Games for English glass and I've been thinking about rereading the others. How do you get those red boxes? I love them!